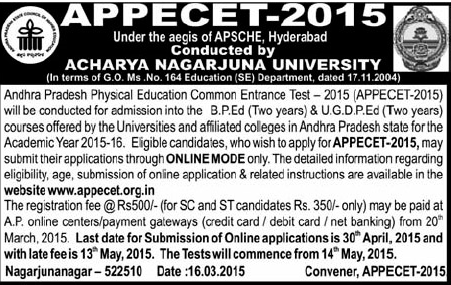 Subject : APPECET 2015 - 2016 is Conducted by Acharya Nagarjuna Univesity, Guntur. PECET - 2015, a Common Entrance Test, which was called as Physical Education Common Entrance Test - 2015 (PECET-2015) this year it will be conducted by Acharya Nagarjuna Univesity of Guntur district, by the CONVENER, PECET-2015, This is done on behalf of the Andhra Pradesh State Council of Higher Education for admission into U.G.D.P.Ed. (2 Years) & B.P.Ed Courses in the Colleges of Physical Education in Andhra Pradesh for the academic year 2015-2016. PECET-2015 application @ Rs 500/- (SC/ST Candidates Need to pay a Fee of Rs 350/-). The Application Forms will be accepted through Online only, and the Payment can be made through AP Online / Mee Seva / eseva centers, Payment can be made through Credit Card,Debit Card. Starting of Submission & Registration of Online Applications : 20-03-2015. Last date for online submission & Registration without late fee : 30.05.2015. Last date for online submission & Registration: 13.05.2015 (with Late Fee). Download Hall Tickets From : Before 10 days of Examination at official website. Date of Examination : From 14th May -2015.